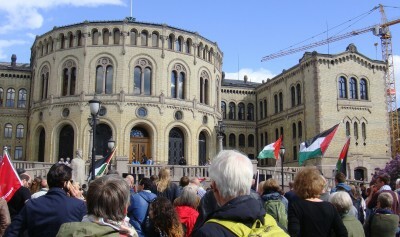 Lots of people turned up and the sun was even shining, but the message at a rally in front of the Norwegian Parliament this week fell once again on deaf ears among most politicians inside the building. They voted against recognizing Palestine as a state, despite years of political and financial support from Norway. 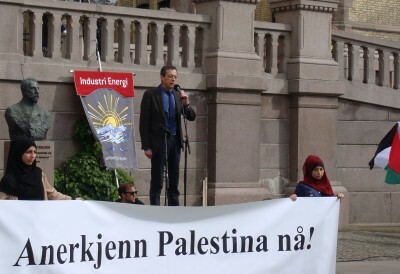 The proposal to recognize Palestine was put forward by the Socialist Left party (SV), and its deputy leader Bård Vegar Solhjell was among those speaking at the rally on Wednesday. The Labour, Liberal and Center parties also favour a Palestinian state in principle, but they all voted against SV’s proposal along with the three parties that formed a majority regardless: The Conservatives, the Progress Party and the Christians Democrats. It was amidst much cheering that Labour, which remains Norway’s largest single party, agreed at its last annual national meeting to recognize Palestine as its own nation. Labour has long supported the Palestinians and Norway, when Labour led the government, set off some shockwaves when then-Foreign Minister Jonas Gahr Støre sent his state secretary Raymond Johansen at the time to Gaza to meet with Hamas after it won local elections. So why wouldn’t Labour back SV’s proposal? Labour never went as far as proposing recognition of Palestine when it led the government either, though. The Liberals felt the same way as Labour, that “we are in favour of a Palestinian state,” according to the party’s Sveinung Rotevatn, but only in its annual meeting documents. The Center Party, meanwhile, still wants a two-state solution and was skeptical that SV’s proposal was the best way to achieve that. “It could easily become simply symbolic politics instead of real policy,” said the Center Party’s foreign policy spokeswoman Liv Signe Navarsete. Those attending the rally on Wednesday, which took place just as Foreign Minister Børge Brende was in Brussels to lead a new meeting of the donor group for the Palestinians, were disappointed, but probably not surprised. Most have grown accustomed to the lack of any real progress on efforts for peace between the Palestinians, who are split themselves, and Israel, which now has a new conservative government that many claim has no intention of contributing towards the reality of a Palestinian state. Norway has a long history of trying to broker peace between the Israelis and Palestinians, only to be frustrated time and again. Amro Alhourani, the Palestinian ambassador in Oslo, thanked Norwegians for their steady support for Palestinians. Speaking calmly, firmly and without notes at Wednesday’s rally, he noted that recognition of Palestine is “at least 17 years too late.” Many in the crowd called for Norway to do as Sweden did when it became the first EU member to recognize last fall. Newspaper Aftenposten noted that fully 136 of the United Nations’ 193 member nations have done so, few of them western.